I recently visited the Marine Mammal Care Center (MMCC) at Fort MacArthur with my mom and a friend. The MMCC is located at 3601 S. Gaffey Street, San Pedro, CA, 90731. They are opened daily from 10 a.m. to 3 p.m. This is a small center that is open to the public. They do not ask for donations or an entrance fee to the facility. When I say it is small, I mean it is small; but if you are with children there are plenty of places within minutes to visit such as the Korean Friendship Bell. The Bell area offers lots of grassy areas for kids to run, have picnics, or fly kites and it offers an ocean view which is dynamite for sunsets. It is the same address as the MMCC but the next driveway up. The MMCC was opened in 1992. It is authorized by the National Marine Fisheries Service. Their goal is to rehabilitate federally protected seals and sea lions that strand in Los Angeles and Ventura counties. (Note: I was taking pictures through double sets of rubberized chain link fencing which can be seen in some of the pics). 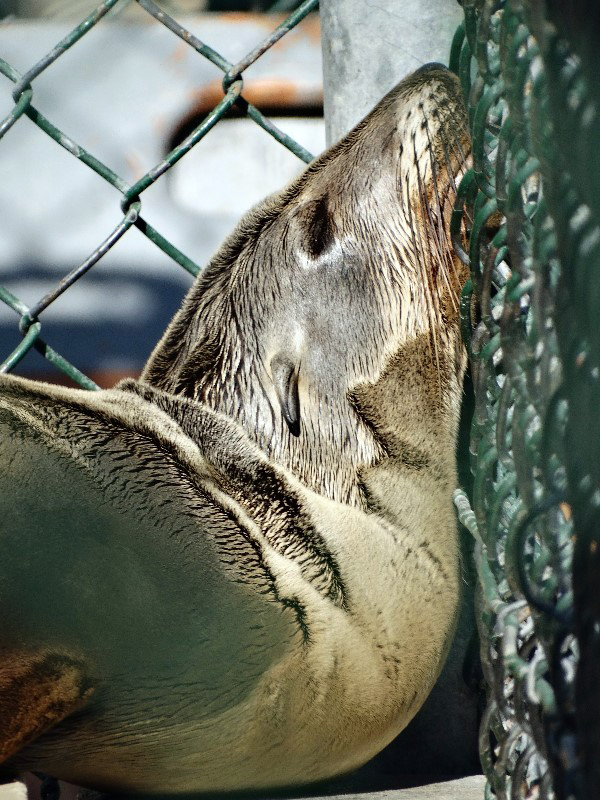 Several hundred marine mammals are treated here each year and then released back into their natural environment. Most are youngsters suffering from malnutrition, dehydration, heavy parasite loads, and bacterial or viral infections. Others are victims of human interaction, such as being caught in fishing lines, abuse, gunshot wounds, etc. 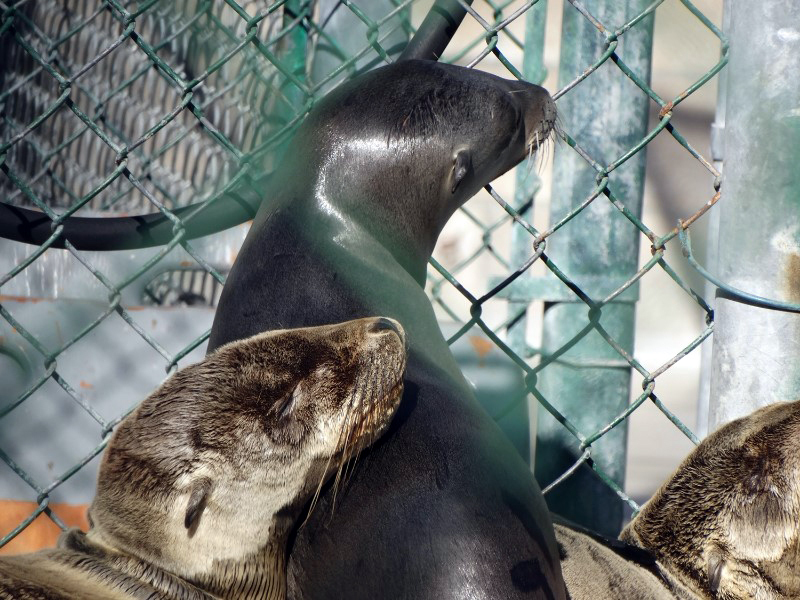 MMCC treats a variety of seals and sea lions. During my visit, they had Guadalupe Fur Seals, Harbor Seals, and Northern Fur Seals, to name just a few. 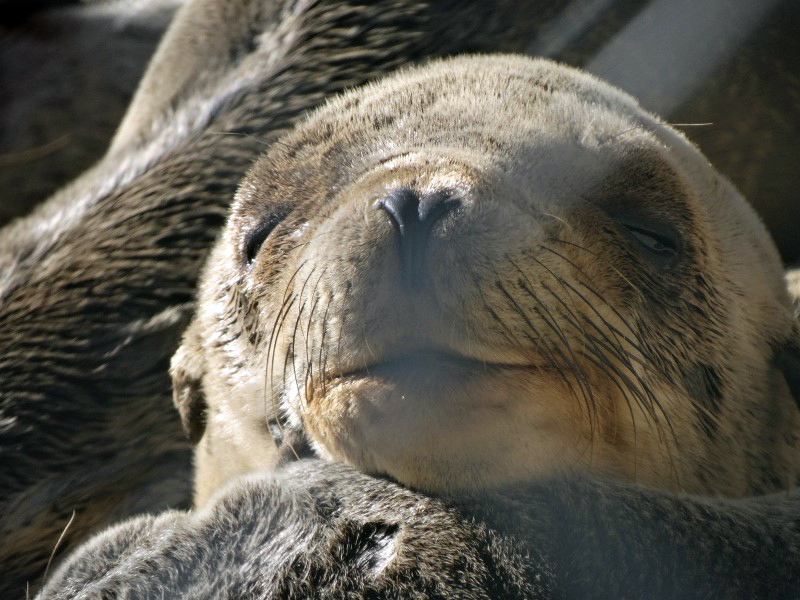 Little is known about the Guadalupe Fur Seals as they were hunted almost to extinction before researchers were able to study them. They are members of the otariid family (sea lions) and have external ear flaps and long front and hind flippers. 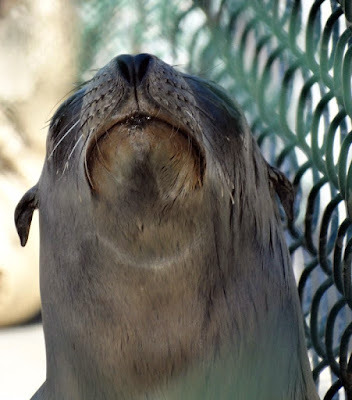 They are slightly smaller than Northern Fur Seals. Males reach 6 feet and 300 pounds and the females reach 4 feet and 100 pounds. In 1925, they became extinct in California waters. Today, the only breeding colony is off Guadalupe Island off the coast of Mexico, but increasing numbers have been seen off California's Channel Islands. 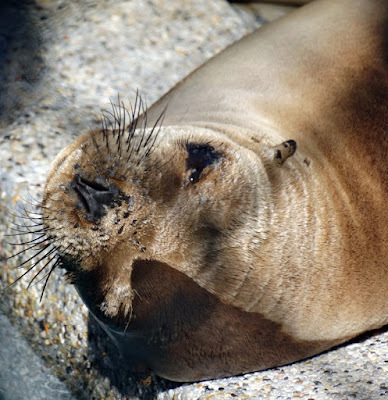 Some have stranded on the central California coast and it is not known if this is from El Nino conditions or if it is a sign they are returning to their former range. Let's hope they are returning to us. 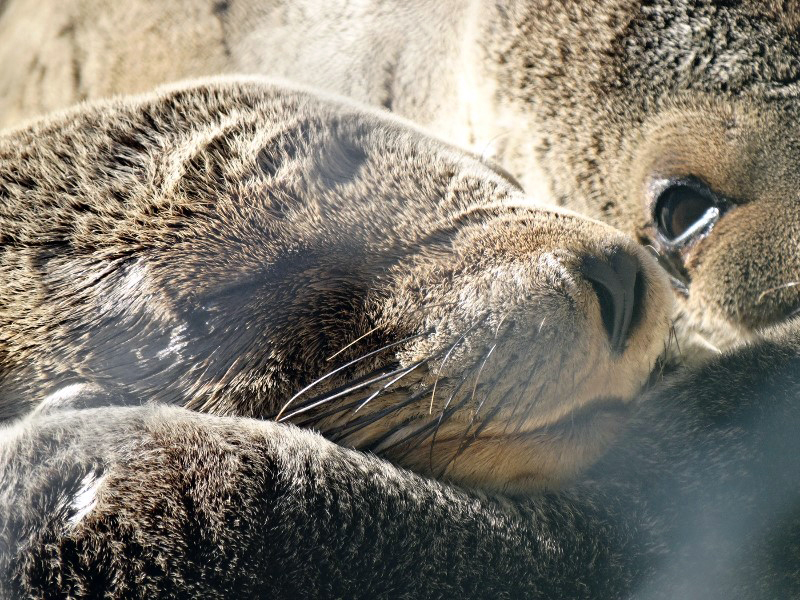 The Pacific Harbor Seals have spotted coats that come in a variety of shades. Males reach 5-6 feet and weigh up to 300 pounds and the females are slightly smaller. 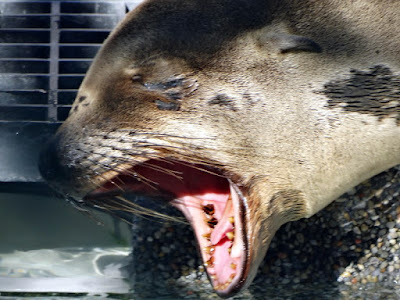 The Harbor seal is a true crawling species. They have no external ear flaps, small flippers and move by flopping along on their bellies. They are found North of the Equator in both the Pacific and Atlantic Oceans. They can range from Alaska to Baja California and Mexico. 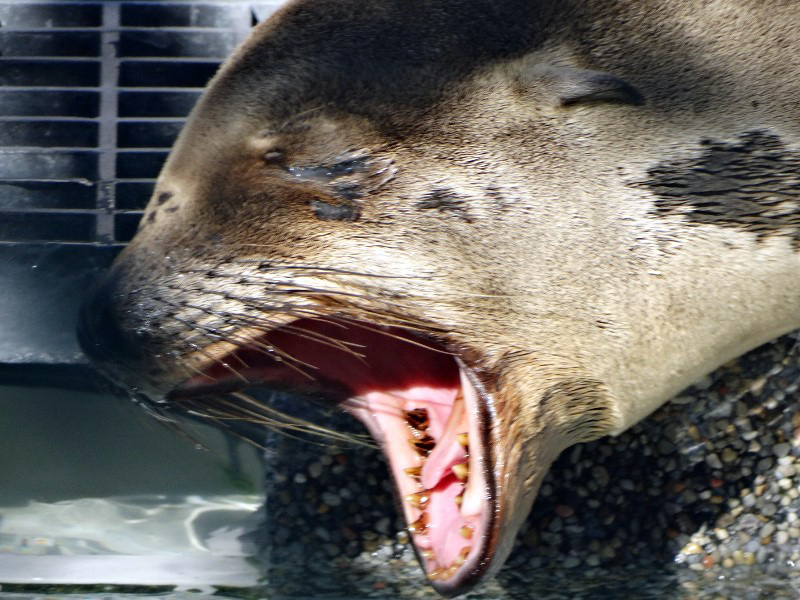 Northern Fur Seals are named for their thick fur which has 300,000 hairs per square inch! They were first named "sea bears." Males are much larger than females, even at birth. Male pups weigh 12 pounds and can grow up to 385-605 pounds and 7 feet in length. Female pups weigh 10 pounds and grow to 66-110 pounds and 4.5 feet in length. They range throughout the Pacific Rim from Japan to the Channel Islands of California. These seals are pelagic (living almost all of the time in the open ocean.) They come ashore for breeding and pupping. 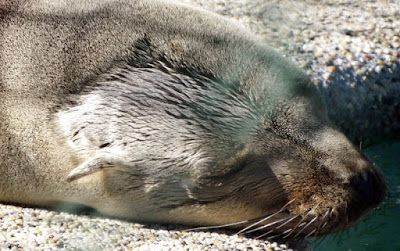 They are almost never seen on beaches unless they are sick. They can live to about 26 years, but death rates are high. I found my visit to MMCC fascinating. 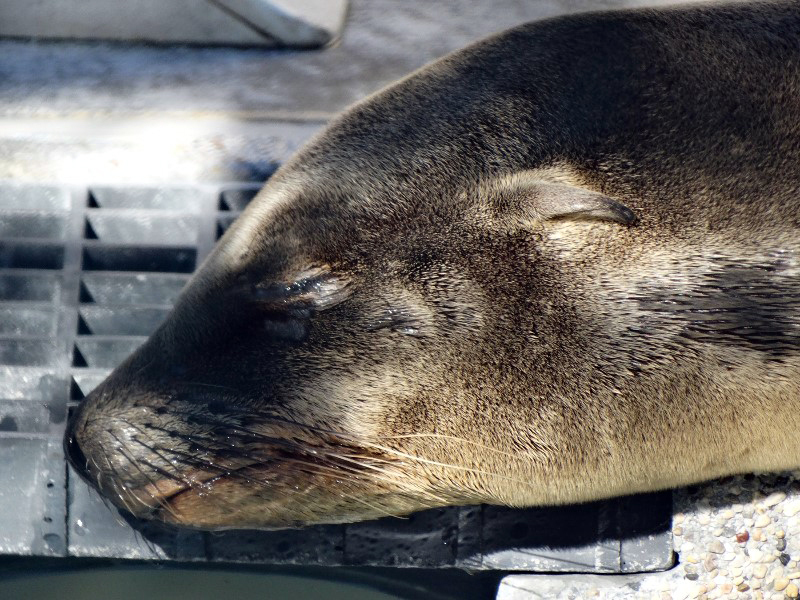 The enclosures were immaculate and made of more expensive materials than I am used to seeing in marine mammal pens. They are kept far enough away from the public so they are not disturbed. There are hired and volunteer staff with plenty of employees around. They were working very hard cleaning, taking notes, and constantly checking the animals. I observed feeding sessions. Two staff hold a large board in front of their feet and enter the enclosure. This prevents the seals from knowing where the food comes from. Each animal has a number shaved into it for identification. 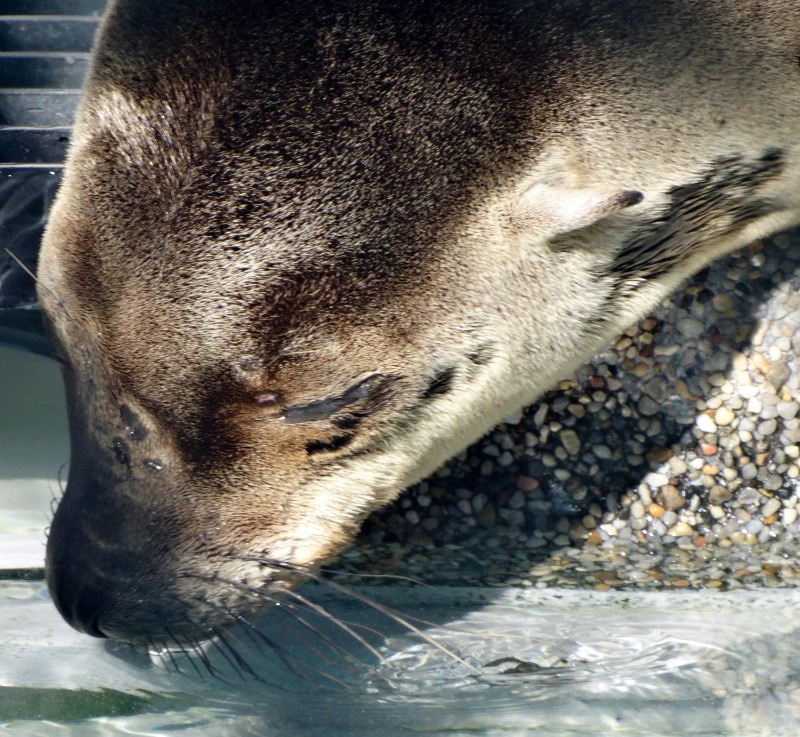 As two staff put out fish for the seals, another staff is on the opposite side of the enclosure taking notes on which seals are eating, how many fish they ate, and which ones are eating on the substrate of the enclosure or are eating inside the pool (each enclosure has a pool area). I attempted getting pictures of the seals eating but they were too fast for me. I was so impressed with how well the animals are cared for. Their welfare seems to be the top priority. Aside from the enclosures, there is a small gift shop that offers a variety of items. The MMCC shirts were only $12 and no tax which was awesome. Parking is free and plentiful during the week (not sure about weekends.) Across from MMCC is a marine bird rescue center but it was closed to the public due to the birds getting overly stressed and traumatized when visitors are allowed inside. I encourage anyone who has an interest in marine mammals and their welfare, and are in the San Pedro area, to stop by and visit MMCC. This happy little guy gets to see another day due to the diligence of MMCC and their staff. Good vibes.